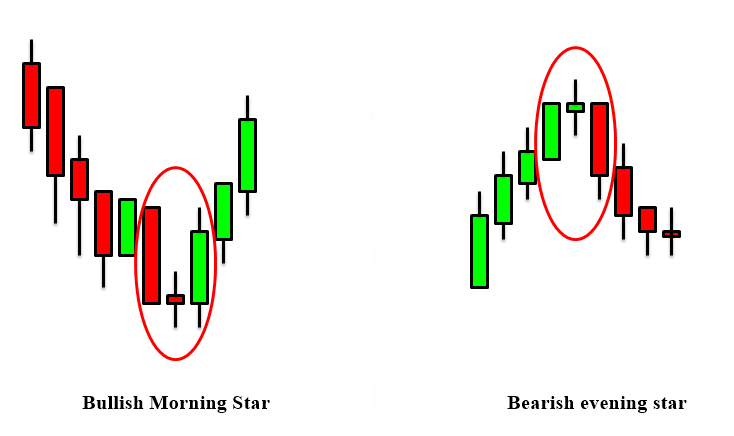 In the above figure, you can clearly see that the bullish morning star is formed by the combination of three candlestick pattern. The first candle is a long bearish candle and after that, we have a doji or pin bar in this type of candlestick pattern. The last candle will be long bullish candle which completes the bullish morning star pattern. The bullish morning star pattern is usually formed at the key support level of the market so it’s extremely important that you know how to draw the key support in the market. 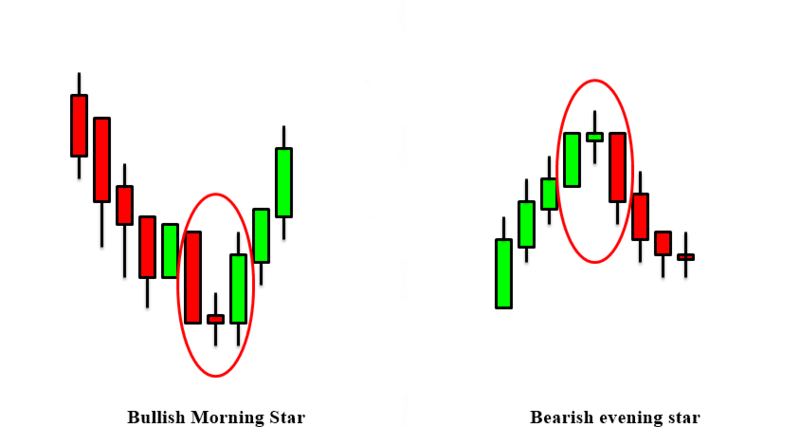 The bearish evening star is also formed by the combination of three candlesticks. The first candle is long bullish candle followed by a bearish pin bar or doji. The last candle is a long bearish candle which confirms the validity of this bearish morning star pattern. This pattern is usually formed at the key resistance level of the market. Trading the bullish morning star pattern in the forex market: The bullish morning star pattern is very much popular in forex trading. The professional traders draw the key support level in the market and wait for the price to retrace back towards the support level. Once the price retraces back they wait patiently for the bullish morning star pattern formation. But as a professional price action trader, you should be extremely careful while trading this pattern since you need to draw the support level perfectly in the market. 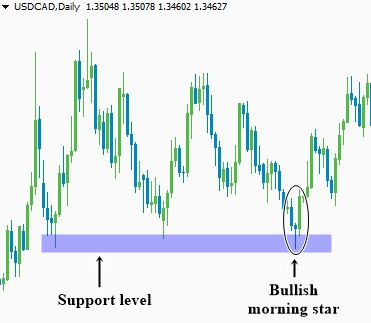 In the above figure, the professional trader has drawn the support level of the USDCAD pair on the daily chart. After successfully drawing the support level in the market they waited patiently for the pattern formation. You can clearly see the formation of the bullish morning star pattern at the key support level in the market. Once the pattern is formed the expert execute their buy entry in their trading chart. Setting the stop loss and take profit level: Professional price action traders usually use a very precise stop loss in the market while trading the bullish morning star pattern in the forex market. They generally set their stop loss just below the tail of the candlestick pattern in the market. The potential take profit level is set to the nearest key resistance level in the market. Many professional traders book 50 percent of their profit once the market hit their initial take profit level. They simply use the trailing stop loss features to ride the newly formed bullish trend in the market and maximize their profit. But make sure that you use the higher time frame in the market while trading this bullish morning star pattern in the chart. Bearish evening star: Trading the bearish evening star is pretty much similar to bullish morning start trading. Most of the time the bearish evening star pattern is formed right at the key resistance level of the market. Professional traders execute their short orders in the market once they see the complete formation of the pattern at the key resistance level in the higher time frame. The expert price action trader usually set their stop loss just above the bearish morning star candlestick pattern. Their potential take profit level is set to the nearest support zone in the market and once the price hit the support level they close half of their open position in the market and use the trailing stop loss features to maximize their profit in the market. Summary: Price action trading is extremely profitable in forex trading. But as a price action trader, you should always trade the higher time frame in the market. If you trade the smaller time frame then you will have lots of false signal in the market and most of your trade will hit your potential stop loss. Professional price action traders prefer the daily time frame to trade this pattern in the forex market. Though the price action signal is extremely profitable but it is highly imperative that you use proper risk reward ratio in every single trade and never trade with the money that you can’t afford to lose.